Following a special inquiry conducted by the Auditor General’s Office, a series of damning accusations have been directed at the New Ireland Government and a clique of Malaysian businessmen. The inquiry concluded K2 million of development funds were used by New Ireland Provincial Government to build Parliament Haus and a new residence for the Governor, Sir Julius Chan. The funds were paid through a shadowy corporate structure the centre at which stands Sir Julius and his right hand man Sir Noel Levi. It landed in the account of C & C Group, a recently registered company owned by two Malaysian businessmen, Mr Peng Chun Chee and Mr Ming Hii Ell. At the time C&C was operating illegally in PNG. Then the money was stolen. The special audit aimed to determine if Provincial and District Administrations expend Provincial Services Improvement Program and District Service Improvement Program funding in compliance with public finance laws and regulations. New Ireland under Sir Julius Chan’s leadership received an ‘F’. One contract, in particular, was singled out for special condemnation by the Auditor General. It was executed by the New Ireland Provincial Government with C&C Group in 2012. During this period the C&C Group was owned by two Malaysian nationals. It did not have foreign certification, according to Investment Promotion Authority records. New Ireland, therefore, had no business entering into a contract with this illegally operating entity. The contract was in the amount of K3.92m. This meant it should have been put to open and competitive tender through the Central Supply and Tender Board. According to the Auditor General, it was not. The funds were earmarked in equal proportion, K1.96m, for the design and construction of Government Haus in Namatanai, and the New Ireland Governor’s residence in Kavieng. That each project was anticipated to incur the exact same construction cost is an immediate red flag. The Auditor General offers an additional observation, what has a new residence for the Governor, Sir Julius Chan, got to do with provincial development, for which the funds were intended? The financial arrangements between the Provincial Government and C&C Group, functioned through an intermediary, Public Works New Ireland Limited. During the period concerned 2012/2013, the shares in this company were owned by Sir Julius Chan on trust for the New Ireland Provincial Government. Oversight of the company was in the hands of Directors under the leadership of its Executive Chairman Sir Noel Levi, arguably New Ireland’s most distinguished civil servant and career diplomat. Public Works New Ireland Limited’s stated function is to supervise works contracts on behalf of government. According to its annual return for the offending period, Public Works New Ireland has executed this role with one employee and no assets. The Auditor General’s Office has flagged its concerns before about Public Works New Ireland Limited. It claims the company was set up to, in effect, circumvent Public Finances (Management) Act 1995 stipulations, opening up provincial moneys to the risk of misappropriation. The example of C&C Group is a case in point. According to the Auditor General C&C Group invoiced Public Works New Ireland Limited, who in turn invoiced the New Ireland Provincial Administration, in effect shielding the illegal firm from the scrutiny of administration officials. By the end of 2013, more than K2 million has been paid to Public Works New Ireland for building materials and design costs claimed by the C&C Group. And there is likely good reason the provincial administration was kept out of the picture, Auditor General inquiries found they were deeply concerned about the arrangement with C&C Group. It was noted, that the last payment was made in November 2012 and at the time of the review, no significant progress had been made on either building with only concrete reinforcing on site. Discussions with senior staff of the New Ireland Provincial Administration revealed that materials purchased for use on the construction of both projects were of poor quality and rejected as unsuitable for use in the construction of the buildings. The Auditor General continues: “Notwithstanding the delivery of sub-standard materials, and the lack of progress with construction, progress payments continued to be made, and in some cases instalments were paid that exceeded the requirements of the contract schedule”. It then appears C&C Group took the money and ran. When provincial officials appealed to a parent company abroad, they were evidently told “the C & C Group was no longer operating in PNG and that the person who had managed its operations in PNG had disappeared with the funds that had been paid out under the contract”. 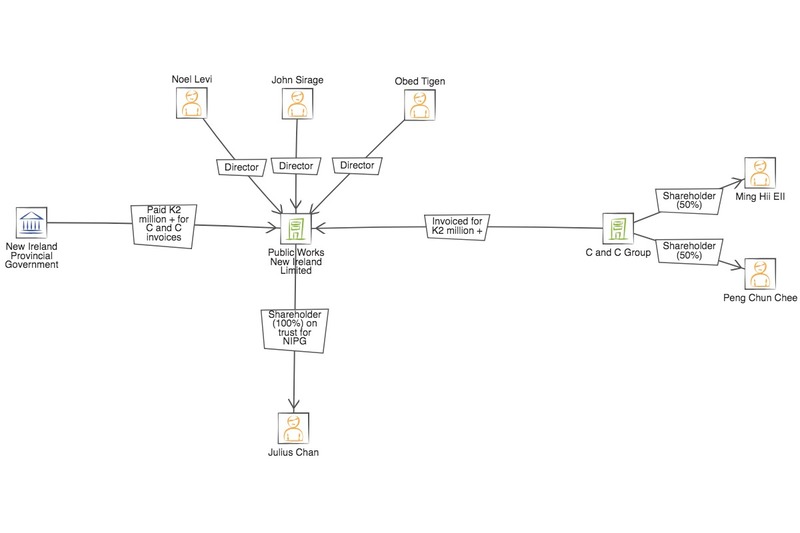 Examination of company records from this period, indicate C&C Group was owned and managed by two individuals, Mr Peng Chun Chee and Mr Ming Hii Ell. It is unclear from the audit, if one or both were involved in the allegation of misappropriation. A Facebook account set up under the name of Peng Chun Chee, contains the photograph presented above. The photograph features the apparent owner of this Facebook account, standing alongside Sir Julius Chan, whose arm is held by a young woman. 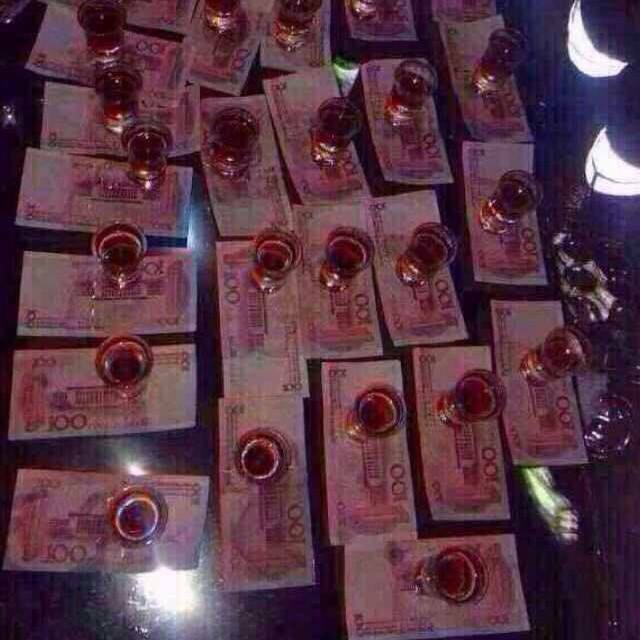 The same Facebook account posts images of the lavish money fuelled lifestyle enjoyed by its owner, including top priced French Cognac, drunk from glasses positioned on top of money bills. 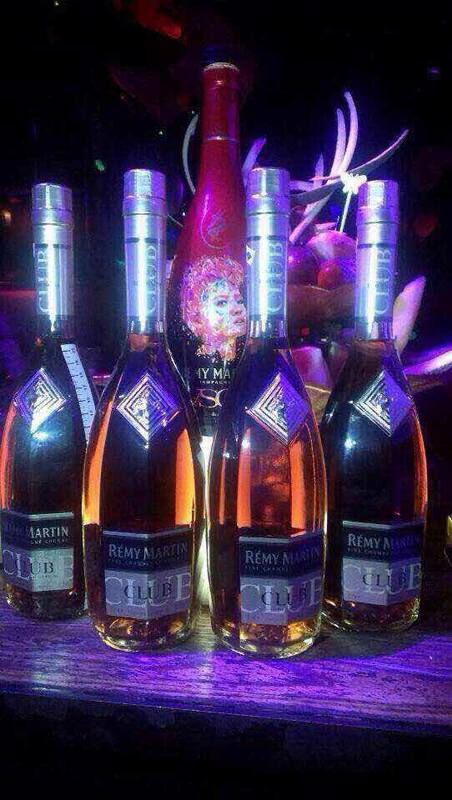 Image: Remy Martin Club retails abroad for around K450 per bottle, to purchase it in a club or restaurant would be considerably more expensive. 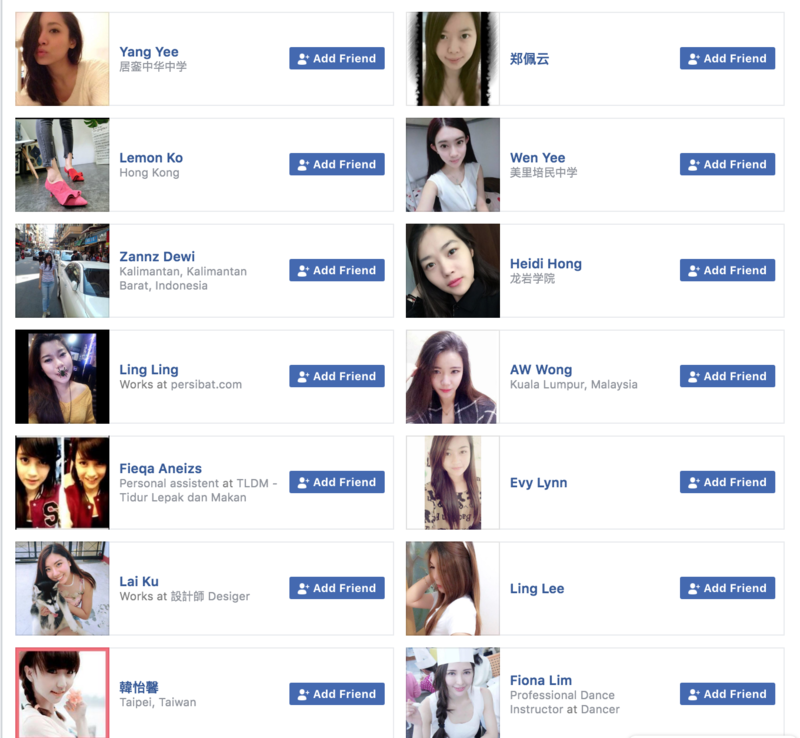 Examination of the Facebook accounts ‘friends’ list, and an associated Instagram account, shows the owner has a large volume of friends, who appear to almost universally be extremely young women. We can only assume the owner is a feminist, reaching out to young women across Asia to help them realise successful business careers. Image: A similar theme in the Instagram account linked to a Peng Chun Chee. The people followed are nearly all young women. We have censored an explicit image. A Facebook account for a Mr Ming Hii Ell, resident in Port Moresby, was also found. It was more sedate by comparison. Sir Julius Chan and Sir Noel Levi, over to you – please explain how a company you were responsible for, paid millions in development grants to an illegally operating Malaysian firm, whose executives are alleged to have run off with the money? Why did you fail to observe Public Finance (Management) Act provisions? 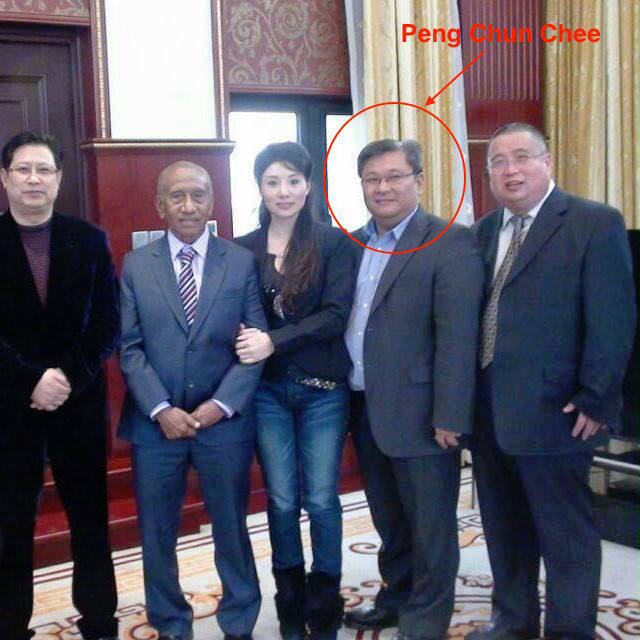 Sir Julius what is your relationship with Mr Peng Chun Chee, who you have been pictured with? And Sir Julius and Sir Noel, just so you can evidence you are not conspirators in this alleged act of misappropriation, can you please provide documentation showing you reported this theft to police and assisted with any subsequent investigation? Thanks!